This week I was surprised to be nominated by, writer extraordinaire, Geoff Le Pard in a Five Photos Five Stories challenge. Geoff blogs at TanGental where he shares numerous and beautiful photos of his garden, family, travels and adventures. He writes an eclectic assortment of prose and poetry, memoir and fiction, with content both challenging and humorous. He also posts at the speed of light with at least one post each day. I can understand why the challenge would appeal to Geoff. I’m not like that. I tend to stick to my routine of two posts each week and write mainly expository text about education with a response to a flash fiction prompt by Charli Mills thrown in. I rarely write explanations of or stories about photos and mostly use photos to support and add interest to the page. Why would Geoff nominate me? Well it seems Geoff must have known something about me that I didn’t, as I have decided to throw caution to the wind and join in the challenge. These are just a few of my favourites. As you can see I have chosen a range including picture books and chapter books for children and both fiction and non-fiction titles for adults. There are others that should have been there but I could not fit my entire collection into one photo! Books have always been an important part of my life and I think a love of reading is one of life’s greatest pleasures. My love of books and reading is one of the reasons, if not THE reason I feel so passionately about education and the teaching of literacy. Sharing a learner’s excitement at becoming literate is both an honour and a joy. I have been privileged to share that excitement with many children during my teaching career, and of course with my own two children who both learned to read well before starting school. I have written about the importance of reading many times before, including here, here, and here. 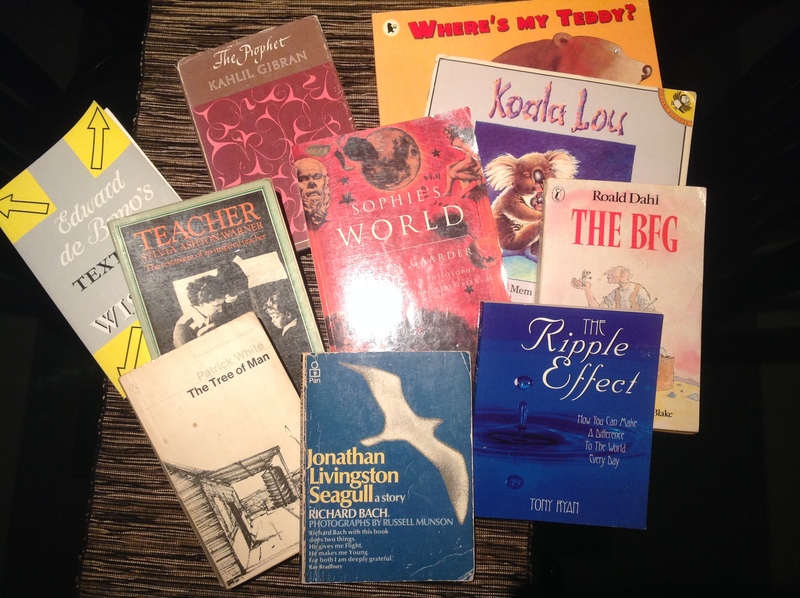 For this post, and for this photo, I will share ten totally random recollections of books and reading from my younger years. And now I nominate the lovely Michelle James who blogs at Book Chat to take up this challenge if she so wishes. Her love of books is at least as great as my own! Thank you for reading. I appreciate your feedback. Please share your thoughts about any aspect of this post. This entry was posted in Blogging, Early childhood education, Education, Favourite reads, Literacy education, memoir, Picture books, Stories, Writing and tagged books, challenge, Literacy, photos, Reading, Stories, Writing on June 14, 2015 by Norah. Great shot of books, Norah! And a great line-up to read, as well. Books are important to lots of us although I have to admit that I am trying to limit myself to ebooks as I have run out of room. I find it very difficult to dispose of books which you too must find judging from the age of those pictured. I wish I was like Bec and could bring myself to write in the margins. It would add so much more meaning to the book but I just cannot bring myself to do it. Another reason why I like ebooks I can note away and highlight and not feel in the least guilty. Happy highlighting. It doesn’t give me the feeling that I am defacing which it does when I do it in a paper book. I love the idea that Bec said however that it adds value to her because she can come back. I have appreciated that in the odd second hand book that I have come across with notations. The thing that I dislike most about ebooks is not being able to lend them to anyone which also adds a history to them that I find delightful. I agree with you about the disadvantage of not being able to lend ebooks, or audiobooks. It makes them a more expensive purchase from that point of view. I also agree about buying notated second-hand books (not that I do it very often). The comments can be very interesting. What a lovely collection of thoughts about books. I can relate very much to the eagerness to finish reading a book, only to be sad it’s over. I am finding I am missing the world of Thomas Covenant, after finishing the series earlier this year. I suspect I’ll be re-reading the series in a few years’ time. Though unlike you (based on point 9), I’ve developed a habit of needing to annotate, highlight, and ‘flag’ books as I’m reading them, particularly non-fiction, or allegorical fictional. My most recently read books include words jotted in the margins, underlining, and little tabs sticking out at points which resonated with me as I was reading. I assume this is a habit coming from reading for research – not wanting to lose the best bits because I expect I’ll want to return to them later on. It makes me feel that the individual books are more valuable to me as they now contain not only the author’s thoughts and ideas, but my own interpretation too, and though this I’m more engaged with the content. I like the sound of Geoff’s challenge, and I look forward to the next 4 installments in the series! Thanks for sharing your thoughts, Bec and especially of your reading habits, including annotations in the margins. I haven’t done this for a long time, except in non-fiction. I may mark passages I wish to remember or return to at some future point e.g. to quote or comment on. However at school when reading Shakespeare was a requirement, I’m not sure I could have managed without multiple annotations and scribblings of meanings and thoughts. Poetry was another that sometimes required clarification of interpretations to be noted in the margins. oh that smell! I’m so with you. Glad it tickled your fancy Norah! I will get to it, Norah. Thanks. I have several other challenges on the back burner waiting for things to calm down around here. I think I have read Sophie’s World three times, and would love to do so again! One of the times I read it to Bec when she was about twelve. It is such a clever book. I really enjoy Gaarder’s writing. I have read most, if not all, though I haven’t looked for a new one recently. I attending many of his seminars back in the 1990s. Sharing your pleasure in books and the eclectic mix in the photograph. Funny how the tactile nature of books can also be so important to us – I’m with you on the feel of those embossed covers. It’s just not the same with an ebook!